Never before in all of my travels have I taken as many photos through the plane side window as I did that afternoon landing in Punta Arenas. First, landing in Santiago I snapped a shot of my first view of the Andes obnoxiously leaning over the kind Chilean woman I had made friends with the moment I sat down. After making my way through customs and immigration and spending way too money much on a sandwich and juice it was time to board the next flight on LAN airlines to Punta Arenas. 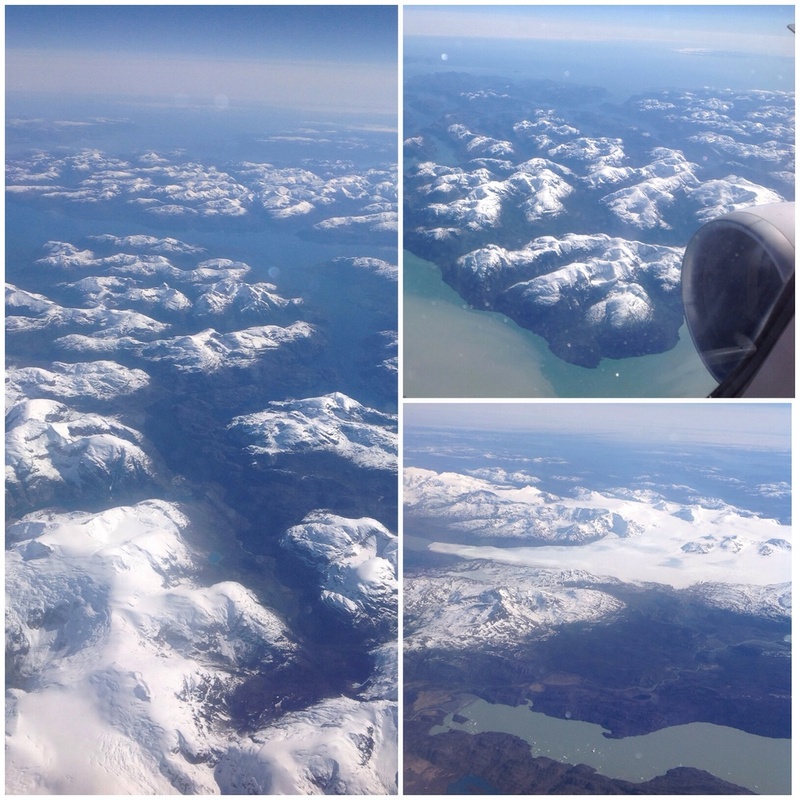 Fortunately I had a window seat and it was late afternoon, so we (my iPad and I) were able to take in the amazing scenery of the Patagonian mountains spreading out before us. Little did I know that this would be my last real view of the mountains until the morning when I woke early, suited up in the running clothing I laid out in my exhausted state the night before I walked the vaguely familiar path back to the lobby to find the friendly faces of fellow racers. Less than 5 hours sleep after 29hours of travel my head was a bit foggy, but with a 40 mile run awaiting me in only one hour's time I had to quickly snap into this current, amazing reality. The sun was starting to illuminate the Patagonian mountains and as the coffee worked its way into my blood stream I couldn't believe I was here. Surrounded by Yassine, Billy and Drew the three I'd been emailing with for two weeks making these very plans. The mountains I've only viewed in photos were waking up in the sunlight just beyond the large glass windows, the remaining snow fields of late spring catching and reflecting the first light and the grand silhouettes then making you tip your head back to take in their full shape. It was a reality I was more than happy to wake up to. Hungry from the long travel, but knowing that I had to race soon, I tried to make good decisions about how much breakfast to enjoy. With many delicious options it was tough, but I managed. The fancy lodge did well to accommodate so many foreign travelers with strong coffee (rare in Chile) fueling most. The 7:15am call for the bus prompted us to hoist our travelers backpacks onto our hips and make the short walk out to the parking lot to await the bus in the chilly morning breeze. This would give us plenty of time to get to the start. Without a bus in sight, I ran around to snap a few photos and take in the moment. It escaped me that I would have many more beautiful photo ops in the coming days. We waited and waited. Yassine offered his houdini pants so that I wouldn't have to dig through my pack and the group of runners shivered and jumped around to keep warm. A large 15 passenger bus arrived about 7:45am and with all of backpacks and goosebumpy legs we piled in for the short drive to the start. From that parking lot we needed to cover the 20 minute walk to the start... instead this served as a good warm up run. We descended a marked walkway onto the rocky beach that opened up to the icy waters and mountain views. Huge glacial chunks bopped along in the Lago Grey like ice cubes in a fancy blue cocktail and the morning breeze was chilled even more coming off the water. Fortunately we did not have to wait long before running back across the beach, up the marked trail and through the parking lot we had left minutes ago. We were running in Patagonia! The lead men took off at what felt like a sprint, maybe to keep warm, maybe to compete. I got a little caught up in both and moved along at a pace that allowed me to warm my icy legs and stop the unnecessary shivers. I soon settled into a pace that felt more manageable for the miles ahead. The dirt road laid out in front of me, and just beyond, the mountains that would inspire me for the duration. I am not a fan of running on the roads, my body just doesn't manage the repetitive nature. I prefer to bounce around, change direction, climb, descend, etc. But if I am going to run on the roads, I decided I want to run on the roads in Patagonia. Almost regretting the decision to leave my phone/camera behind I decided it was for the best as my race pace would have changed significantly. There were so many opportunities to take photos, instead these images are burned into my mind. Of the many highlights that filled the morning and early afternoon, the most magnificent happened in the first 5k. Los cinco caballos blancos. The five white horses. On the long road ahead, off to the right I saw five white horses burst into motion as one. The sun illuminated their manes like a silver lining and the force of their movement nearly stopped me in my tracks. The surge joined the road and the runners ahead of me and continued up the track. The road bent to the left and then climbed the hill in a switchback and I was able to watch their muscles flex and relax as they effortlessly climbed, reached the top and moved out of sight as the road turned back to the right. A few minutes later when I finally topped out on the climb los cinco were off on my left in a golden field of dried grass and vegetation. They stood looking on for a moment as I kept my head turned to watch them instead of the road ahead. When the turn was too much for my neck and I had to look forward again I continued glancing back and soon saw them again surge into motion, this time through the field and further away. Absolutely beautiful and magical... what a start to this race! When the snow capped peaks rise up in front of you at every turn and the gravel road unfolds, twists and turns and rolls along as dictated by the terrain, to say the course was much of the same does not mean it was boring. In fact quite the opposite. The beauty and rhythm of the repetitive turn over was meditative allowing thoughts to flow, come and go, process and be forgotten. One of the many wonderful gifts of running. I made it my goal to run every step knowing that the climbs were relatively gradual and running would mean covering the 40 miles a bit quicker and hopefully keep me in position. With only water and fruit provided along the way I was thankful I stuffed a few gels and Z-bars into the many pockets of a new tester pair of Patagonia shorts to fuel the day. I carried a single UltrAspire Isomeric Pocket also filled with calories. The combination was just enough for the hours spent traversing the 63 kilometers. In addition to the ultra there was also the 44km marathon, a 22km half and 10k. Each race started at the appropriate points along our 63k course and in time so that we would all reach the meta/goal/finish around the same time. I passed through the starts of the marathon and half marathon a few minutes before they began their own races. Running through each starting area brought a surge of energy from the cheers offered by the runners as they jogged around and stripped down to their own racing attire. Soon after I passed through, the lead men of each of those races closed the time gap and passed me in beautiful form. The leader of the marathon slowed his pace to chat with me a bit and I soon realized thanks to his introduction that we know each other from a few email communications earlier this year. Max went on the win the marathon. The lead men of the half surged by me in a group of three, quiet as can be. In the final miles I started weaving through a variety of runners, some that had passed me before, some that started the 10k before I had reached their start. After the final rise the view of Hotel de los Torres was a welcome site likely to all of us. The grand archway of the finish was apparent even with more than a mile to go. I tried to quicken my pace in spite of my tight, limited hamstrings. Covering these final strides the realization that this was my final race of this season brought a smile to my face. Time for a bit of downtime, a few local adventures and exploring a few other passions. But before letting my mind wander too much I snapped back to the hay bales that lined the finish shoot and hi-fived with those lining the shoot who realized by looking at my bib number that I was finishing the 63k. La primera mujer! Every race, every travel experience gives us the opportunity to learn something. It might be a lesson that we needed to be reminded of, it might be a new one, but there always is at least one. With many years of racing and traveling, one lesson I have had to learn is that that there is no perfect way to arrive and prepare for any event in life. Planes might be delayed, people might change their minds, you might cook your favorite meal or you might scavenge a slice of pizza from the airport bar. It is good to realize that we can not control and plan every aspect. There is only approach, execution and attitude that we can influence and always hope for the best.